check out as a guest and use your credit or debit card. Didn't find what you are looking for. Please contact me via the contact us page or call 229-305-5356. The hand crafted soaps listed here contain all natural ingredients and essential oils for fragrance. The descriptions below may contain information on what the essential oil used in the soap has been used for throughout history, but makes no claim that our soaps can be used to treat any such malady. Each of these soaps contains saponified soybean oil, olive oil, coconut oil and safflower oil. This combination gives a nice, creamy lather without drying the skin. 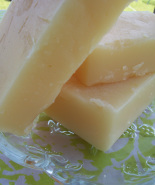 Soaps are all individually packaged to maintain the integrity of the scent. Refreshing, invigorating, get you going in the morning scent! Created with real peppermint tea and peppermint essential oil. The wonderful bubbly lather will leave you squeaky clean without drying your skin! Lovely pink and white confection that smells like candy canes! Created with peppermint essential oil and mica for color. You'll love the way your skin feels after lathering up with this one! Enjoy the sweet, citrus scent of ripe tangerines when you bathe with this bubbly lathering bar. Created with pettigrain essential oil and ground annatto for color. Kick start your morning with the refreshing scent of Rosemary with a touch of mint! Lots of creamy, dreamy lather to pamper your skin! Created with rosemary, peppermint and spearmint essential oils. Natural color from oils. One of my best sellers! Refreshing earthy lemon scent liked by both men and women. Lemongrass has been known for centuries to treat extreme perspiration, athletes foot, muscular pain and aid poor circulation. Uplifting scent with color from natural oils. This old standby is as popular today as ever! Lavender has long been used for its ability to help alleviate the symptoms of eczema, acne, insect bites, stings, head lice, bruises, headaches, vertigo, migraine, fainting as well as for its relaxing aroma. Natural color from oils. Oatmeal meets Lavender in this heavenly bar. Feels sensational on the skin!. Color from natural oils and oatmeal. Delicate, floral scent! Has been used to stimulate the memory and is very hydrating. Color from natural oils. Sweet, minty scent that smells like "Doublemint" Gum. Very Energizing! Color from natural oils and mica. Do you have extra sensitive skin and looking for dye and scent free? Well here it is! Has all the same great qualities and lather as the others bars without any scent or color added. Wonderful, fresh scent like linens on a clothesline! Great bubbly lather! Color from natural oils and mica. Rate or Parcel Post within the Continental US.